Organika Stevia Powder is a plant-based alternative to table sugar and other preservative filled sweeteners. It does not contian carbohydrates, calories, or sugar and can be used in tea, coffee, baked goods and much more. Directions: 1/8 teaspoon in 2 L of liquid. Use sparingly, too much Stevia may taste bitter. I use this all the time in my tea. 1 little scoop is enough for 500ml worth of tea and doesn't make it too sweet. I don't find it has a bitter aftertaste when I use it this way. A container lasts me for months. I found It to have a bitter after taste that I did not like. Just began using this product. No funny after-taste. Very happy with it! 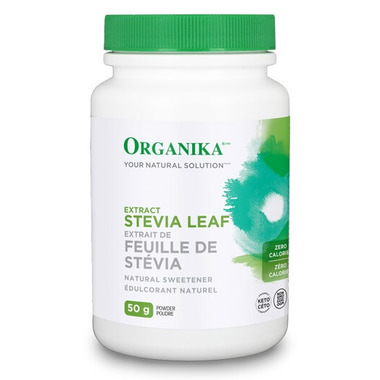 I have been using stevia in the white powder form for 20 yrs, originally introduced by my Naturopath who owns a custom supplement business and I use it daily as opposed to other artificial sweeteners that are harmful... this is the best buy I've found! !